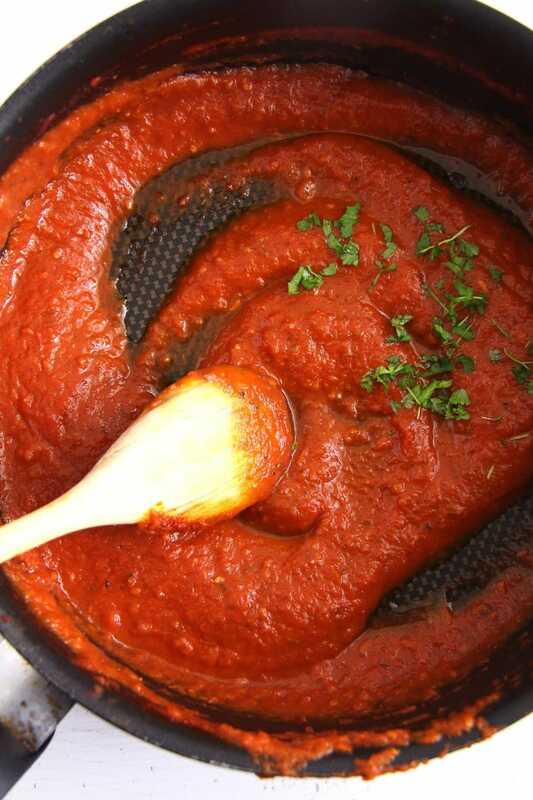 Smooth and flavorful basic tomato sauce, easily made and extremely versatile. You might wonder why a recipe for a basic tomato sauce? Tomato sauce is readily available and from the processed sauces one can buy, tomato sauce is not the worst. Depending where you buy and how much you are ready to pay for it, you should be able to get a decent quality nowadays. 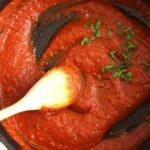 Over the years I have made lots and lots of different tomato sauces mostly because there was a time when my son’s favorite and one of the few dishes he actually ate was spaghetti with tomato sauce. We had some difficult “eating” years with Bruno, I am telling you, I cannot believe how much he changed in this area. So, in order to make it more interesting for the rest of us, I kept changing the tomato sauce. 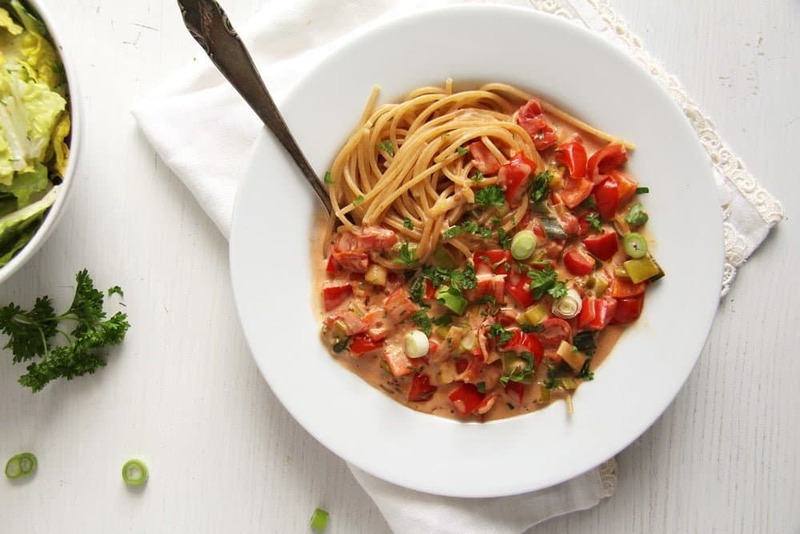 I would sometimes only use tomatoes and onions, and then again tomatoes, carrots and peppers, sometimes I would make it with fresh tomatoes shortly cooked in the pan, sometimes I would use tomato puree or make a roux where I would add tomato paste. In the end I came up with this combination, which I like most of all. 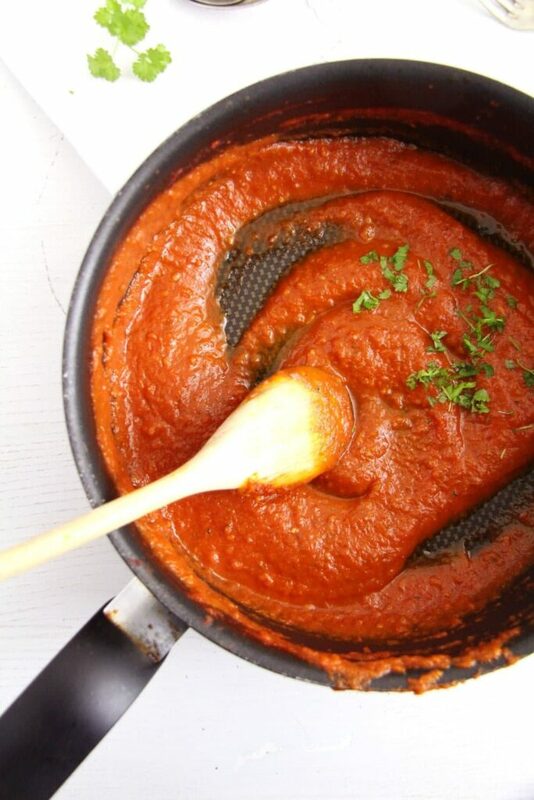 A pure tomato sauce, which can be eaten on its own with pasta or which can be used as a basis for lots of other dishes. I could not call this basic tomato sauce Romanian, not because we don’t eat enough tomato sauce in Romania, but just because you will find a similar sauce in probably any other country in Europe. So I just call it a basic homemade tomato sauce and let you decide if you want to make it more Romanian by using some typical Romanian herbs like savory or lovage, or make it Greek by using thyme or Italian by using oregano. It is up to you. 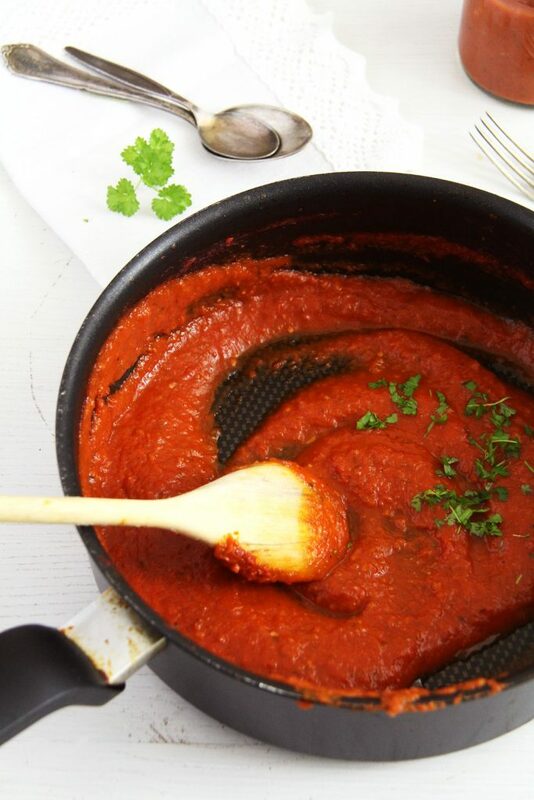 One thing I can tell you, no matter what herbs you use, you will be delighted with this tomato sauce and you will not want to buy the ready-made one anymore. Chop the onion and the garlic cloves finely. Heat the oil in a large pan and cook the onions until translucent. Add the garlic, stir it shortly in the pan. Add the canned tomatoes and if they are whole crush them roughly. I do that with my hand, take them in the hand, squeeze and break them taking care that the juices inside them won't splatter all over the place. Add the pureed tomatoes, tomato paste, herbs, bay leaves, sugar salt and pepper. Bring to a boil and cook on a medium-high flame for about 20 minutes. Turn the heat a bit down and continue cooking for about 15 minutes until the sauce has a nice thicker consistency. Adjust the taste with salt, pepper or a bit more sugar, if necessary. Remove the bay leaves from the sauce and puree the sauce with a blender, according to your preference, you can make it as smooth as you like it. Sprinkle with parsley before serving. Makes about 2 jars, depending on their size, which keep in the fridge for about one week. To keep it longer freeze the jars. It can be eaten on its own with spaghetti for instance or it can be used in other recipes requiring tomato sauce. Being a parent is not easy, huh? Your family is really lucky to have you cook for them, Adina. The tomato sauce looks very fresh and packed full of flavour. I make my own tomato sauce too, it’s sugar free and so much better than a shop-bough one. I’ve added chocolate in one for nachos and it was amazing. It’s much more versatile than the ones in the supermarket. 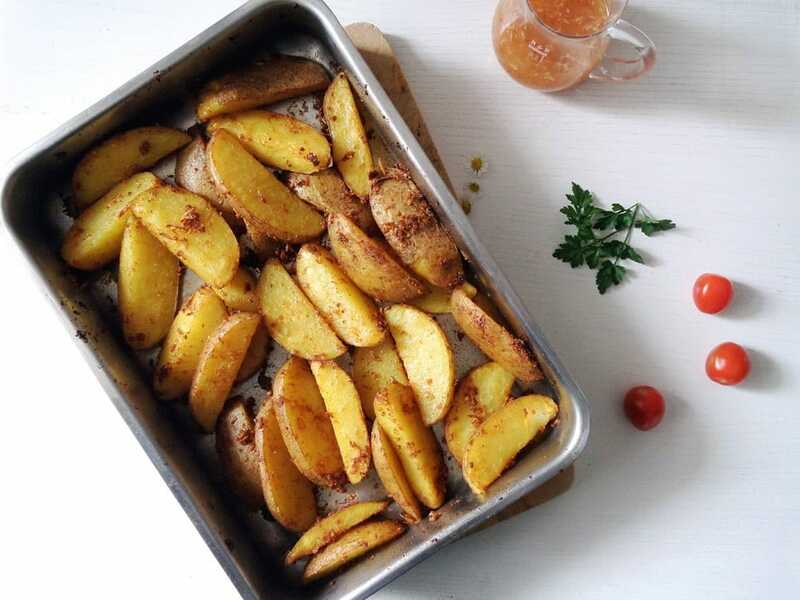 Adina, Your pics look lovely and this sauce sounds delicious! 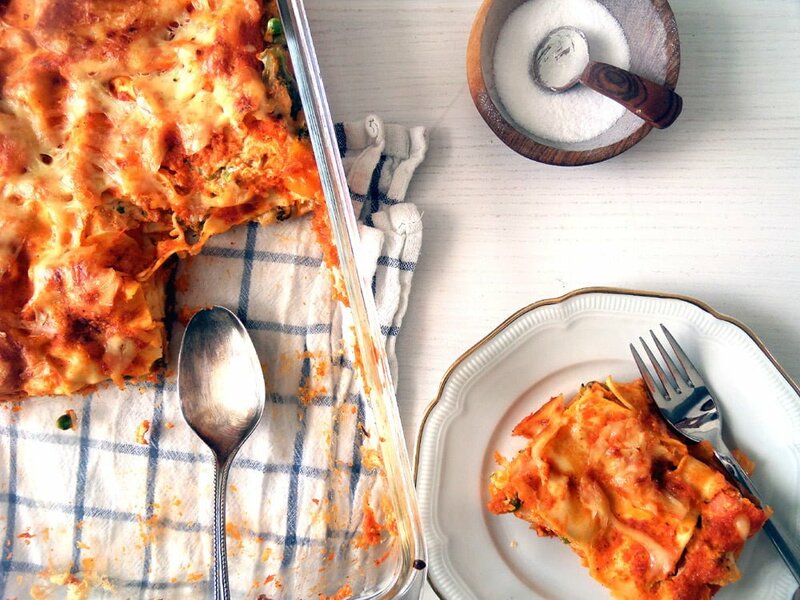 Your recipe isn’t showing on this page….maybe double check. I’d love to give it a try! Sorry, Kathy. I fixed it! Hi Adina! I just made this sauce … delicious!! I can’t wait to try your eggplant dish! !